NCC Board Vice-President Julie Rowland accepts the Mental Health Hero Award for the agency. 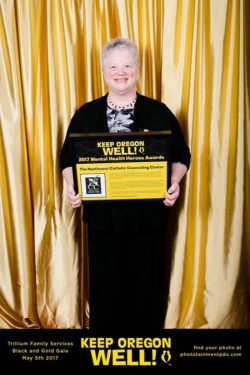 On May 6, NCC was recognized as a Mental Health Hero at Trillium’s Black& Gold Gala. The event took place at The Nines in Portland. Those in attendance included Mental Health Heroes from this year and years past. Their stories of triumph, healing, resilience, and community-building were featured throughout the night. Other festivities included dinner, dancing, a live auction, and the launch of the 2017 Keep Oregon Well Mental Health Heroes awards. NCC was one of 31 individuals and organizations who were recognized at the gala. Every day in May, each of the recipients will be honored for their role in paving the way for mental and behavioral healthcare to thrive in Oregon. Be on the lookout for NCC on May 29! We will be featured on the Trillium website and across the Keep Oregon Well social media network.